Backpacking socks are an important part of your backpacking clothing. They make a big difference in the comfort of your feet and should be given some consideration before using just any pair of socks. Below we’ll cover some of the important aspects of the proper socks. First, it’s important to consider the type of backpacking you will do. This will make a difference in what you look for. Backpacking in colder climates will call for warmer socks, while backpacking during warmer weather will not. Socks are made of different materials: wool, synthetic, cotton or a blend. Wool socks are great for keeping your feet warm and providing cushion. Wool socks can even retain warmth when wet. On the other hand, wool tends to wear out quicker than other materials and it takes a long time to dry. Wool alone can also be itchy. Synthetic materials are designed to insulate and wick moisture. While they aren’t as warm as wool, they still do their job. These socks are more durable and softer. 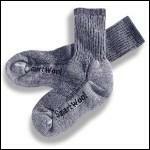 Cotton socks should be avoided because they don’t wick moisture away from your feet. They also dry slowly and don’t provide warmth when wet. Also, blisters are guaranteed with 100% cotton socks. Most backpackers prefer their socks to contain a blend of materials. A wool synthetic blend is the most popular choice as it has all the pros of each material, while eliminating the negatives. Next, we’ll look at the different socks you might encounter: liners, lightweight socks, midweight socks and mountaineering socks. Liners are a thin sock worn under other socks. They are designed to wick moisture away from your feet and help prevent blisters by reducing friction. These socks can be worn alone; however, they do not provide much cushion. Lightweight socks are designed for warmer weather. They are thicker than liners and thus provide more cushioning. They are designed with moisture wicking as a priority over warmth. Wearing a liner with this type of sock is generally unnecessary. Midweight socks are designed for moderate to cold weather. They have more cushioning and insulation than lightweight socks. In fact, many have extra padding in areas like the heel or ball of the foot for extra comfort in these high impact areas. These socks are designed for warmth over moisture wicking and should be worn with liners. Mountaineering socks are designed for extremely cold weather and tough terrain. They have the most insulation and cushion of all the socks. Wearing liners with these socks is a must. Make sure your socks fit snugly. You don’t want any extra material bunching up in your boots. It is helpful to get socks that are machine washable and dryable. Be sure to test your socks in your hiking boots. It’s important to make sure everything fits okay. In fact, we recommend you not buy boots without trying them on with backpacking socks first. The added thickness from socks can change how a boot fits. Always make sure you have a dry pair of socks available on your trip. Wet socks are uncomfortable and lead to blisters. It’s good to alternate between socks, allowing the previous day’s pair to have a chance to dry out before use again.